Switch Key Fever, Presentation & Conductors Lanterns of the Western Maryland Railroad, Cosmetic Restoration of a Railway Express Agency Scale, History of the Dietz Vesta Lantern (Part III), Timetable Reprints, Q&A Answers: Long Island Rail Road Badges. 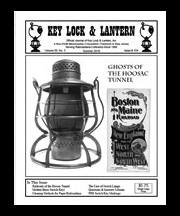 Ghosts of the Hoosac Tunnel, Modern Brass Switch Keys, The Care of Switch Lamps (1903), Pennsylvania Railroad Switch Key Divisional Markings, Cleaning Paper Railroadiana, Q&A Answers: NYS&W Key, Adlake Key Serial Numbers, Hocking Valley & Weirton Lanterns. 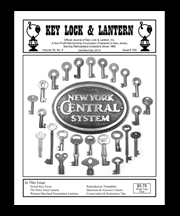 Key Lock & Lantern Convention Exhibits, NYO&W Adlake Alphabet Switch Keys, Reproduction etched lantern globes, the New York Susquhanna & Western Railway, Rare New England Lanterns, Q&A column, Photos from along the line. Owney, the Railway Post Office Dog, History of the Dietz Vesta: Part 2, Reproduction China, Digital photo editing tips, Romer lock advertisement, "Charlie Card" honors song about Boston's subway, Q&A column, Photos from along the line.